Infused with 3 spells for wealth! 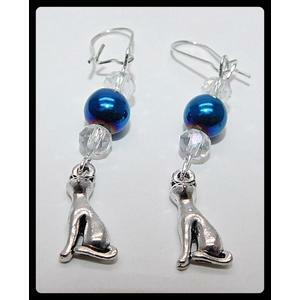 Handmade with blue shimmer hematite, glass beads and tibetan silver. All you need to do is wear this lovely piece or keep it close to you and its magickal energies will connect with your own personal energy! Once the connection has been made the spells will begin to work their magick to bring you good fortune and wealth in a variety of different ways in accordance with what the 'powers that be' feel is right for you! Results will vary from person to person depending on what the 'powers that be' have in store for you! Previous clients who have chosen these triple cast jewellery pieces have reported back to us with news of all kinds of results ranging from small scratch card wins to larger lottery wins and job promotions! Let this gorgeous witches cat make some magick for you too!